Evie has had a busy month! First she got the norovirus and gave it to Mommy, Daddy, our nanny, Yin-Yin, Ah-Gong, and Ah-Ma. Then she started teething again and is getting in her 2 front teeth! On Palm Sunday, Evie got sprinkled! That is to say, Evie got baptized! I've been waiting for this day for almost a year. Evie gives Pastor Dave "the eye"
We would have done it sooner, but it's so much easier to baptize a baby when you don't have to lug an oxygen tank on the stage with you, and photos are so much nicer without oxygen tubes! After Evie had her heart surgery at 5 months old, we got busy with my going back to work, and then we put it off for awhile. So the day finally came! Evie was a shining star, and didn't cry at all! 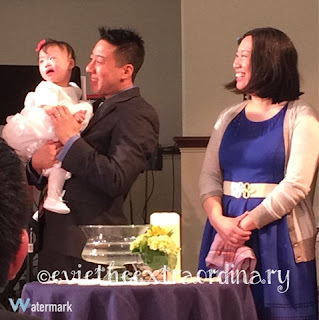 We were happy to celebrate this day of acknowledging that Evie is our gift from God, and that she is a child of God. Evie had quality time with both sets of grandparents this past year. 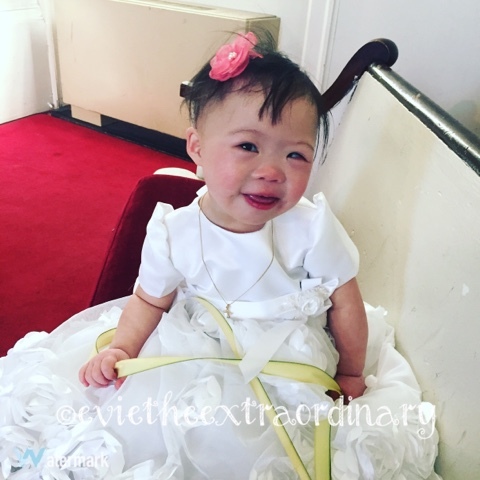 We are grateful for all they have done, especially Evie's Yin-Yin, for helping us to get Evie stronger. Now Mommy and Daddy are on their own with Evie (with the awesome nanny's help!)! And now, time for Evie's Mommy's Product Recs! This product has replaced the bulky ice packs in our freezer. I love their slim fit both in our freezer and in our cooler bag when we have to go out. It's also easier to put them in the freezer bag for her overnight feed with the g-tube. Oh, and I guess they are good for lunch bags too! Totally a life changer when you are carrying around a cooler bag and it suddenly gets lighter because the ice packs aren't as dense. In her EI baby playgroup, I noticed that Evie was starting to show more interest in the bouncy horse. So I did some research and found Rody, which also can have a rocker base. 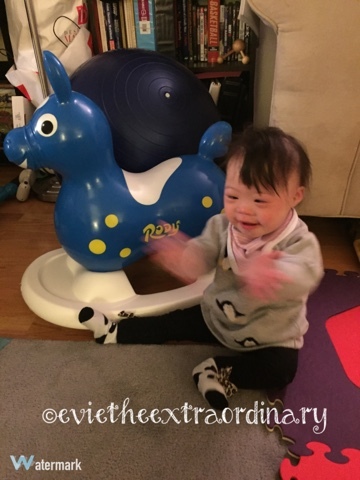 Evie is enjoying Rody more and more! Another lesson we've learned is that a child with low muscle tone should have a high chair with good support. Evie has a Graco Duoliner LX highchair, graciously gifted to her by her Auntie Alanna. I started wondering if she would do better if she was able to sit closer to the table with us, so then I got a Fisher Price Deluxe Booster Seat. But turns out that the feeding therapist noticed that Evie didn't get enough trunk support with this seat, so we switched back to the Graco Duoliner. Oh well, we save it for when Evie is even stronger!